How can we contain some of the deadliest, most long-lasting substances ever produced? Toxic remnants from the Cold War remain in millions of gallons of highly radioactive sludge, thousands of acres of radioactive land, and tens of thousands of unused hot buildings, some of which are slowly spreading deltas of contaminated ground water. Governments around the world, desperate to protect future generations, have begun imagining society 10,000 years from now in order to create warning monuments that will speak across time to mark waste repositories. Filmed in weapons plants, in Fukushima, and in a deep underground burial site, Containment is part graphic novel and part observational essay, weaving between an uneasy present and an imaginative, troubled distant future, exploring the struggle to keep waste confined over millennia. Directed by Peter Galison and Robb Moss, the film premieres on Independent Lens Monday, January 9, 2017, 9 p.m. on OETA-HD. The safe storage of nuclear waste is one of the world’s most pressing issues, yet not a single country has a well-worked out plan for these deadly and long-lived materials. In 1979, the U.S. Department of Energy created the Waste Isolation Pilot Plant (WIPP), the nation’s only deep geologic repository for nuclear waste. As a condition for opening the facility, Congress required that the site be clearly marked against accidental future intrusion. Teams of futurologists, astronomers, science fiction writers — even experts on the search for extra-terrestrial intelligence — were convened in 1990 to imagine far-future scenarios and create a system of warning markers. Using animation and drawings, Containment explores several of the proposed scenarios and potential marker designs, and features interviews with those who envisioned them. Located near Carlsbad, New Mexico, WIPP was built over a salt bed thousands of feet deep and millions of years old, a site considered particularly invulnerable. “We think the only way radioactivity can reach the surface or reach the accessible environment is through human intrusion,” said chief scientist Roger Nelson. But on February 14, 2014, a waste barrel ignited and burst underground, releasing radiation into the environment. WIPP was subsequently closed for cleanup. News reports at the time played down the incident, but a recent Los Angeles Times story indicated that the explosion ranks among the costliest nuclear accidents in U.S. history, with costs that may rise as high as $2 billion. 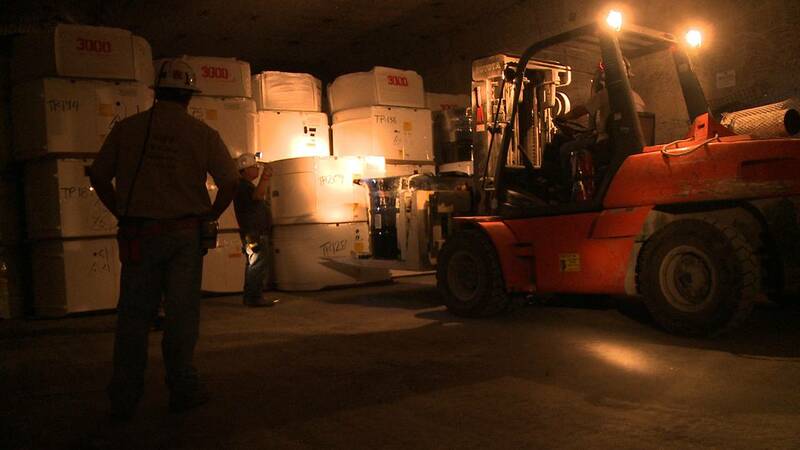 The closure has backed up thousands of tons of radioactive waste from other states that were waiting to be transported to WIPP. In March 2011, Fukushima, Japan became a repository for nuclear waste not by design, but through a devastating earthquake and resulting tsunami. A triple meltdown occurred after the cooling systems at the Daiichi Nuclear Power Plant were interrupted and the spent fuel rods actually boiled the water in which they rested. It could have been much worse, says former prime minister Naota Kan, who reveals that the country escaped an unthinkable disaster only by what he called a “paper-thin margin.” Now deserted, Fukushima is a ghost town, where former residents can only briefly visit the homes to which they may never return to live. At the Savannah River Site, a former nuclear weapons facility in South Carolina, silvery mist and lush green trees mask bright yellow signs prohibiting fishing. Radioactive alligators and turtles live there, scientists say, although efforts are made to contain them within the site’s 314 square miles. The Reverend Willie Tomlin worries about the impact on his rural community, only 50-75 feet away from the nuclear waste site on the Georgia side of the river. Visit the Containment page on Independent Lens, which features more information about the film. Containment will be available for online viewing on the site beginning January 10, 2017.